Cultures, traditions and beliefs abuse and exploit animals in their festivities. They are born condemned to suffering and pain by human ignorance. Still young, many animals are taken from their mothers, captured and used in grotesque entertainment displays. Camels are used as transportation, in reigns, at parties to attract audiences and, alarmingly, in a weight-lifting competition. The animals are loaded with bags of rocks and then forced to stand. The annual event takes place in Pakistan and this year was won by a Briton – Qasim Hussain, 20, who lives in Bradford, West Yorkshire , England. The female camel, guarded by Qasim, Sheezada Kathreela, raised sacks of stones weighing 1.7 tons, the equivalent of a small car. The contest was criticized by PETA, who described the “sport” like animal abuse. 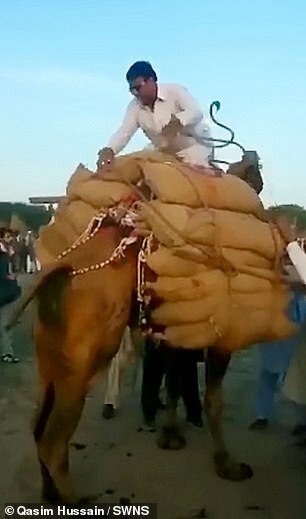 The bags of stones are weighed in front of the competitors before being placed stacked on top of the camels. Then the animals are forced to get up and walk. The whole process takes 15 cruel and painful minutes. The information is from the Daily Mail. Despite opposition from activists, nothing was done to stop the annual camel contest – attended by 20,000 people – from happening again. Sheezada Kathreela’s tutor already plans to attend next year’s ‘event’ and said he will train her more and more.